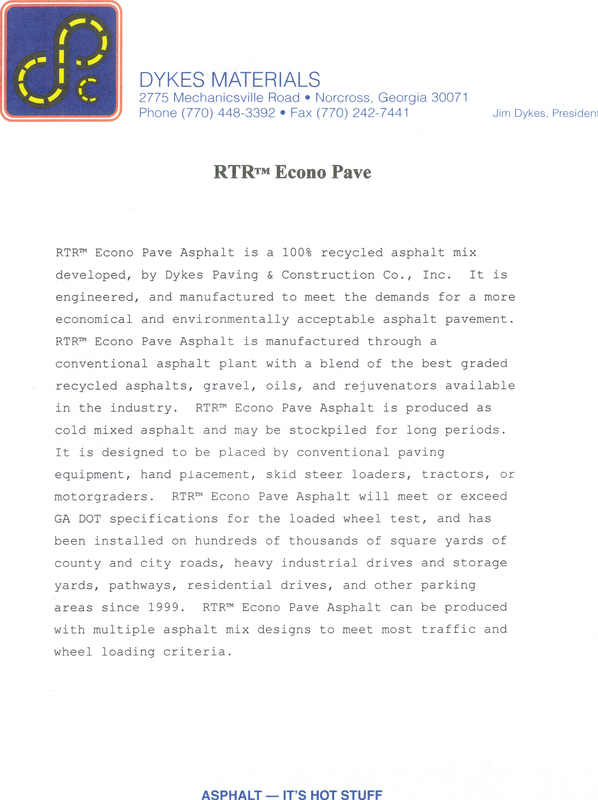 Invented by Jim Dykes in 2001, RTR™ (“Roof to Road”) is an environmentally friendly alternative to traditional asphalt mixes. Composed of broken asphalt from old parking lots and roads, roofing shingles and waste oil from restaurants, RTR™ is the only 100% recycled content cold mix asphalt in production today. While its environmental benefits offer one good reason to choose the RTR™ cold mix product, its strength and durability offer another. Indeed, performance tests show that it has the same structural integrity and pavement life cycle of many traditional hot mix asphalt products. If you are looking for an Atlanta asphalt paving company for a cold mix asphalt job, Dykes Paving is the way to go. When you understand the materials of your trade so well that you actually improve upon existing processes and take paving materials to another level, it says something about your ability to deliver quality paving work. Whether you would prefer our RTRTM Econo Pave cold mix asphalt solution or the RTRTM High Performance option, Dykes Paving has got you covered.